Size: 12inch by 6inch. Round holes standard. Oval holes available. Frames recommended. All full color artwork will be digitally printed. Add oval holes for $0.04 each. Size: 12inch by 6inch. Round holes standard. Oval holes available. 55 mil insert needs no frame! 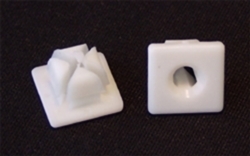 Polyethylene stays white even in the sun! All full color artwork will be digitally printed. Show your dealership off road and on the open road! Size: 7inch by 4inch (custom sizes available - call for pricing) Round holes standard. Oval holes available. Our license plate frames are designed to accommodate a variety of plate sizes. You may choose either raised lettering for a 3-D effect or flat screen printing. Print Colors Available: Yellow, Orange, Red, Blue, Green, Brown, Black, White, Silver, Gold and Chrome, available at an additional charge. There will be a charge for each additional color. Production time is approximately 30 working days after proof approval. Reorders may take 21 - 30 working days. No Set-Up or Art Charge for standard type styles and logo. 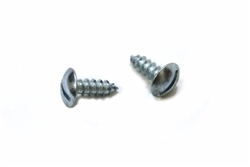 1/4" x 3/4" Slotted Truss Tapping Screw, Zinc plated. 100 count. Rubber License Plate Holder With straps. Very fast and easy way to put dealer plates on a car to test drive. Once plate is attached to rubber holder, just close straps in trunk lid and it's secure. One of the easiest ways to attach a demo plate. 50 per box. Standard size. Magnet adheres to all metallic surfaces of rear deck - trunk lids, bumpers, tailgates for bumper-less trunks. Iron oxide magnets will hold magnetic charge indefinitely and magnets are completely rubber coated so they will not scratch the surface. They are 8" x 1" and will fit all sizes of license plates. Comes in a set of two.